10 Most Common Questions Answered Before your First Skydive - Skyrider Review. Yes, we provide all the necessary equipment and training. And, our googles will help your eyes not dry out as it’s very windy up there. They’re perfect to protect your eyes. Also, if needed, gloves will be provided as well but typically during summer gloves are unnecessary. 2) Can I wear my glasses or contacts? Of course you can wear glasses as long as it is not tinted. When you go skydiving with us, the tandem instructors will provide you with goggles and they can accommodate glasses or contact lenses since they fit comfortably on top of glasses. Some of our skydiving instructors even wear glasses! 3) If I just got out of surgery can I jump? You always should consult with a healthcare professional for medical advice in advance. On arrival or on the phone we can discuss any concerns but we require that (1) you’re generally active, (2) physically fit, (3) not currently under the care of a physician for an ailment. Do you to have a clean bill of health? If you have any previous injuries, please let us know so that we can help accommodate. Definitely consider informing us about shoulders, hips and bones. 4) What if I have a fear of heights? Two misconception exist about skydiving: 1) it feels like a roller-coaster 2) it’s like standing on top of a very high building and looking down. Actually, there’s no depth perception and there are no reference points when you’re on the plane at 18 000 feet because we are so far up. So, when people stand on the ledge of the building and have vertigo sensation, it’s not a realistic analogy. When you jump, you don’t know how fast we’re going because you aren’t passing any buildings. We have our own playground up there – so, this won’t cure your fear of heights but it will take your mind off it. 5) Will it feel like a rollercoaster because I don’t like that feeling? We don’t pull any g force; it feels like we’re floating. We’re not accelerating as we’re already moving at a certain speed when we leave the flying airplane. So, our acceleration is moderate – sometimes under the parachute the “rollercoaster feeling” can happen but the will definitely not happen on free fall. You’ll feel weightless. 6) Can I wear ‘this’? We ask that you dress comfortably and for athletics. We recommend light layers as we’re on the coast which means we get ocean breezes. No accessories are allowed. So, think streamlined and make sure nothing is dangling off you. Leave anything that might ‘snag’ on the ground. Also, this is important, make sure you have athletic shoes and no uggs or slippers allowed. You have to be sure footed. 7) Can I bring my go pro? Safety regulations require a minimum of 200 skydives before even considering any non-essential equipment. As a student skydiver, there are several reasons as to why this is a bad idea. Best to leave it to us professionals while you enjoy the thrill and follow direction from your Instructor. We have a Mediterranean climate in the Monterey Bay region. 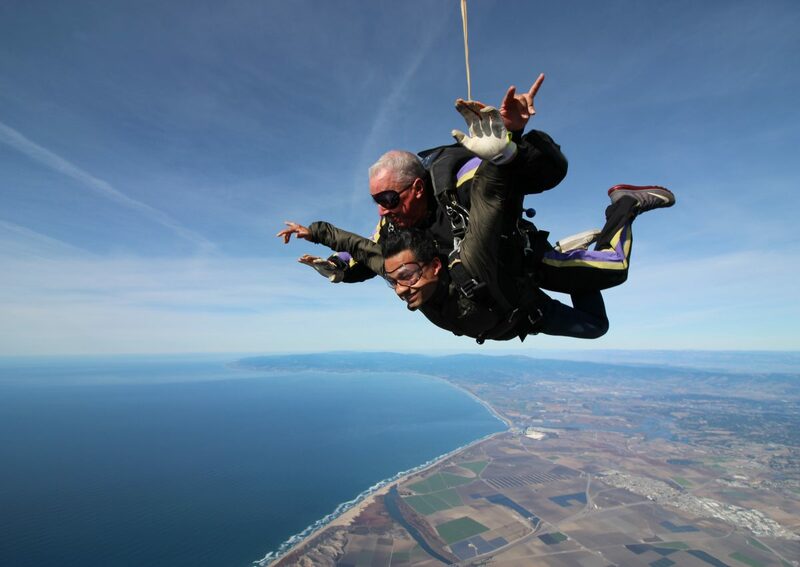 Spring, Summer and Fall are awesome times to jump and the cold is not at all noticeable and also, when you’re doing something as exhilarating as skydiving, you will not be thinking about the cold. 10) Can my family or friends come watch my jump? Yes, please do come! We have a spectator area for this specific purpose. Family and friends are most certainly welcome and if you holler in joy while in the parachute they can hear you. Also, if you get the ultimate video package, the outside video flyer will land first and tell your family and friends what color canopy to watch (because there will be about 8-18 canopies out there) so it really helps to have a color to watch. (Hours): 8am – 8pm Everyday! Next PostCome Take a Look at Our Facilities!